These were not the signs of a healthy relationship. Donald Trump, well on his way to clinching the Republican presidential nomination, was ruthless in his crude attacks on rival Ted Cruz. He repeatedly mocked the senator as “Lyin’ Ted,” suggested his father played a role in the assassination of John F. Kennedy, and even made fun of the appearance of Cruz’s wife, Heidi. Two-and-a-half years later, Cruz will take the stage at Toyota Center in Houston with Trump, who is holding a rally to help Cruz in his surprisingly close reelection battle with U.S. Rep. Beto O’Rourke, D-El Paso. Their rocky journey from nomance to bromance hinges largely on political expediency — a shared recognition that both benefit more from an alliance than a running feud. 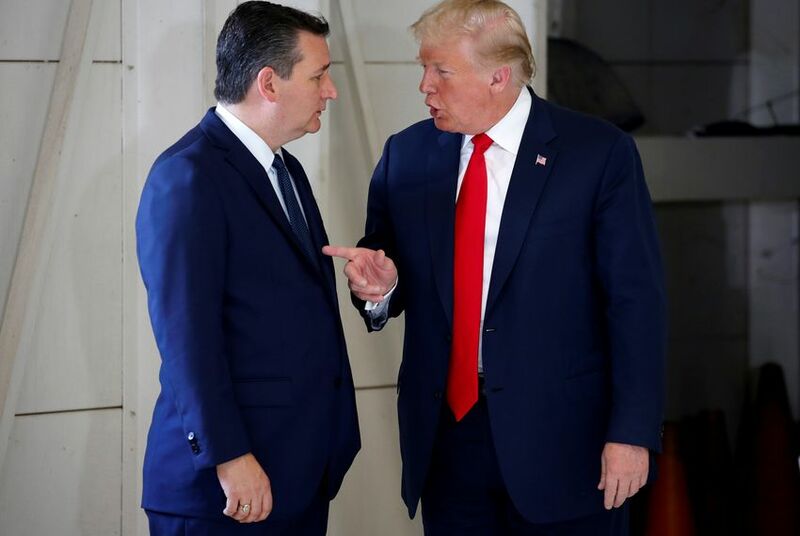 “Look, they went to counseling, things are okay now, they’re back together, they’re getting along now,” said Rick Tyler, an MSNBC political analyst and Republican strategist who worked as a spokesman for Cruz’s 2016 presidential bid. In the Senate, where Trump holds a razor-thin Republican majority, the president appreciates that Cruz has emerged as a steadfast ally on a range of critical issues, from trying to repeal former president Barack Obama’s heath-care law to passing tax cuts to pushing through conservative judicial nominees. And Cruz understands that, especially in a state like Texas, bucking the sitting Republican president — however controversial — is not what most of his supporters want. Trump also has the ability to offer a boost in his Senate race, which has emerged as one of the most hotly watched in the country. The relationship, however, was not always contentious. Cruz and a few aides traveled to Trump Tower in 2015 for a cordial visit with Trump. And early in the campaign, Cruz’s team made a strategic decision not to attack Trump in the hopes that the Texas senator would emerge as the last candidate standing against him. Cruz invited Trump to a rally at the Capitol against the Iran nuclear deal and even worked to organize a never-realized joint trip with Trump to the southern border. But then things went south — a turn so acrimonious that reconciliation, when it came, was haltingly slow. The nadir came at the Republican convention in Cleveland. After Trump won his party’s nomination, he asked Cruz to speak at the convention and endorse him. With feelings raw, Cruz — who still commanded the loyalty of a swath of conservative and evangelical voters — consulted with a small group of loyal aides and family members. Some counseled not speaking at the convention at all, while others said that if he did appear, he needed to be prepared to endorse the party’s nominee, according to current and former advisers. But Cruz, with the support of some in his orbit, alighted on a third option: He would accept the coveted speaking slot but refuse to endorse Trump. Cruz knew the decision was contentious and privately rehearsed a range of scenarios, advisers said, from getting heckled to Trump coming out on stage to accept an endorsement that was never offered. The moment — which produced a roar of jeering and boos and Trump’s surprise arrival in the convention hall — unnerved even some in Cruz’s orbit. Many of his own donors excoriated him, including megadonors Robert and Rebekah Mercer, a reclusive father-daughter duo who took the rare step of issuing a public statement criticizing him. The Cruz team — who say they sent an advance copy of his speech to the Trump campaign — felt set up to fail, while the Trump team felt burned by Cruz. Finally, after weeks of private discussions between the two sides, Cruz endorsed Trump in a Facebook post at the end of September 2016. In his post, he called Hillary Clinton, the Democratic nominee, “wholly unacceptable” and touted the “very strong list of potential Supreme Court nominees” Trump had just released. Most notably, the list — from which Trump had explicitly promised to choose to fill his first Supreme Court vacancy — included Sen. Mike Lee (R-Utah), who is close friends with Cruz and who Cruz had pushed to be included as a key sticking point for his endorsement. The Facebook endorsement came two weeks before the “Access Hollywood” tape emerged, featuring Trump bragging and speaking lewdly about kissing and groping women without their consent. But Cruz remained loyal to Trump, a moment the president’s allies have not forgotten. By the time Trump won the presidency, Cruz was prepared to work with him. Shortly after Election Day, Cruz convened a meeting with his Senate staff and offered a stark message of support for the new president, people familiar with the discussion said. The Texas senator rattled off a number of his key priorities — moving the U.S. Embassy in Israel, withdrawing from the Iran deal, passing tax cuts, repealing Obama’s health-care law, appointing conservative judges to the bench — and talked about working with Trump to promote a shared agenda. “We can do everything we set out to do — just in this case it will be President Trump signing most of these bills,” Cruz told his staff. There were personal gestures as well. Cruz visited the president-elect at Trump Tower shortly after his election for a warm meeting that stretched on longer than expected. The Trumps invited the Cruzes, and their two young daughters, to dinner at the White House, and the Cruzes also dined with Trump’s daughter Ivanka and son-in-law, Jared Kushner, at a corner table at Fiola Mare in Washington. Kushner joined Cruz for one of his weekly pickup basketball games in a gym in the Dirksen Senate Office Building. Another bonding moment came when, shortly after the election, Cruz and Trump Jr. were seated together during a think tank dinner. The two hit it off — one Cruz adviser said the seating arrangement was slyly intentional — and Trump Jr. invited the senator back to the lobby of the Trump International Hotel in Washington for drinks. The two stayed late into the evening, and Trump Jr. later told friends he knew it was not easy for Cruz to join him there. When Trump Jr. and his team noticed the polls tightening in Cruz’s Senate race, they reached out to his campaign and offered to help. Earlier this month, Trump Jr. traveled to Texas for a full day of events with Cruz: three fundraisers and two rallies. And on Monday, the president will also appear alongside Cruz. Like many makeup stories, this one has competing versions about who made the first move. Both sides claim the other reached out first, and there has been some light grumbling. Some in Trump’s orbit believe he is doing Cruz a favor — “It’s the middle of October,” said a senior White House official. “Do we really want to be spending our time in Texas?” — while least one Cruz ally surmised that Trump wants to claim credit now that it appears likely Cruz will win. There are signs that Cruz’s detente with Trump has helped improve some of this other relationships, as well. Graham, who has emerged as one of the president’s key allies, once quipped that Cruz was so unpopular that if he was murdered on the Senate floor, none of his colleagues would vote to convict. Ahead of their rally, however, Cruz still sounds a bit hesitant about Trump — declining Sunday to say whether he views him as friend or foe.